One of the reasons I bought our Mitsubishi iMiEV was to replace a Chevy S10 Pickup truck, which has almost 300,000 miles on it and a number of small mechanical problems. We hadn’t intended to use the iMiEV AS A TRUCK, but it turns out that for some people an electric car makes a pretty good truck after all. To start with, lets take a look at why I had a truck in the first place, and see how an EV actually might be a pretty good replacement. Hmmm. Things I like about a truck. Well, good view of the road, lots of headroom, I can throw bikes in the back, I can tow our camping trailer or a utility trailer, it’s manly to drive a truck, I can carry engines or big electric motors in it, The bed can get beat on (I don’t have to worry about it looking nice), and well, I guess that’s about it, but IT’S A TRUCK! So, how does the tiny adorkable electric car compare? I actually have a pretty good view of the road. The car sits “above” its battery pack, so it’s a little taller vehicle than you expect it to be. In fact, whenever I park next to a CRV, I’m shocked at how similar they are in a few ways, including height. 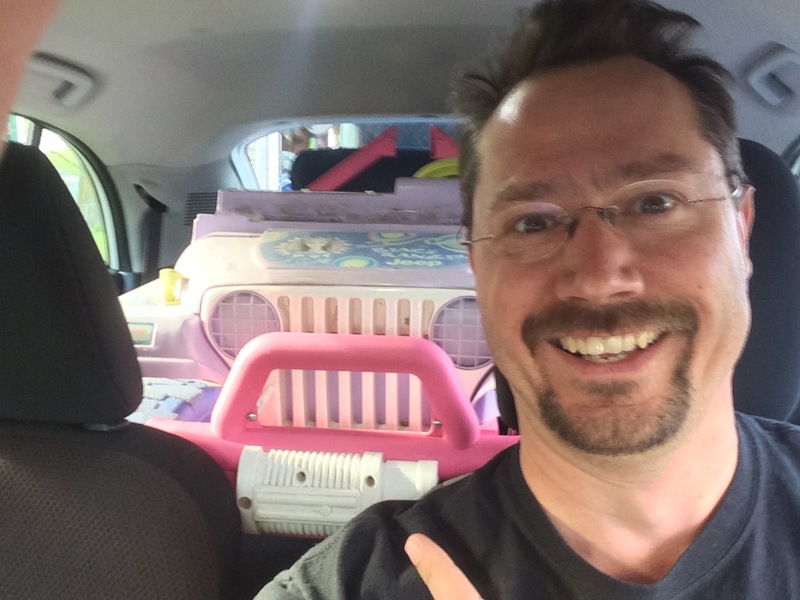 I’m a 6-foot-tall 200 lb guy, and I fit in the car just fine, with plenty of headroom. Our family car is a 2004 Prius, which is a great car overall, but I do NOT like the seating height or view of the road. Can I throw Bikes in Back? Well, kinda. 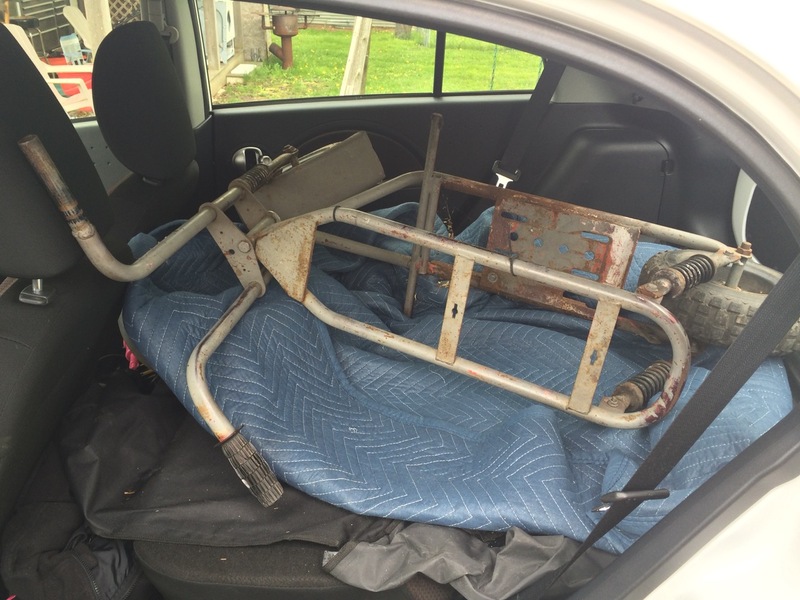 I did pick up a mini-bike frame earlier this summer, and I literally DID just toss it in the back of the car. Full size adult bicycles don’t fit back there too well. However, they DO go well on a bike rack, which can be mounted at the back bumper. An aftermarket roof rack would work too. I also found that an entire PowerWheels electric car fits right in the back of my car! This one is actually so good that I’ve already blogged about it. YES! Electric cars tow great! For starters, there’s NO SHIFTING! In my truck, I have to go through all five gears to pull away from every traffic light to then get back up to full speed. With the electric, all I do is press the accelerator! That’s it! No clutch, to engine rev, not even the slushy shift of an automatic transmission! Also, electric motors are known for torque! Even though my car has one of the least powerful motors on the market, LOW END TORQUE is what you want for pulling away from the traffic light with a heavy load. On the opposite end, the REGENERATIVE BRAKES not only recapture otherwise lost energy, but really work GREAT with trailers. It almost feels like the more weight behind you, the better regen works! Like my pickup truck, the Mitsubishi iMiEV is rear-wheel drive. Normally, that would be considered a deal-breaker in my area, due to winter driving conditions. However, the iMiEV has a FANTASTIC traction control system on it. It’s FAR BETTER on snow than my truck ever was. In fact, one winter a few years back, I was towing my Electric Geo Metro behind my pickup to take a friends to work on it. After pulling out onto the main road, my truck got stuck on an icy patch. No problem. I hopped into the towed Metro, turned it on, and used the electric car to push the gas truck back onto a clearer part of the road! I do have to say that I don’t feel particularly macho driving a Hello Kitty Car. However, I do feel like a man knowing that I’m taking care of my family by driving something that costs us less, and am helping the environment to boot. When you see somebody driving a truck suddenly “Roll some Coal”, those aren’t men, those are boys. My vehicle doesn’t determine who I am, but my actions do. The first time I ever met my friend, Rich, he was hopping out of a 1973 Citicar – a tiny plastic triangle of an EV. Rich is the biggest, manliest guy I know. Sure, he’s not that much taller than 5 feet, but the beard, the boots, and his AMAZING skills at welding, car repair, and more, make him the Most Masculine of Men, no matter what he drives. And frankly, aren’t the guys with the sports cars or “truck balls” just overcompensating? To be fair, I have NOT yet carried an engine in the Mitsubishi. The size of the hatch opening does limit what can be fit inside, especially if it is hanging down from an engine hoist. I do still have my pickup truck, but I’ve really only used it for special “Truck Stuff”, and that list just seems to keep getting shorter. Pretty much the only times I’ve used it this summer WAS for moving some heavy equipment. However, I also have a utility trailer. That can handle anything I would want to put on it, and it’s open-topped, so easy to load on and off with an engine hoist or other overhead equipment. One thing nice about a truck is how you don’t have to worry about the bed. It’s metal, it’s outdoors, and if it gets dinged-up, so what! On the other hand, the EV is the newest car I’ve ever owned, and the interior is carpet and plastic. Right after I got the car, I DID put in an interior cover. It’s actually something sold to SUV owners to protect the rear interior of their vehicles from the large dogs they perpetually carry with them. That cover helped keep the car interior clean, but it didn’t protect against extra heavy or pointy objects. 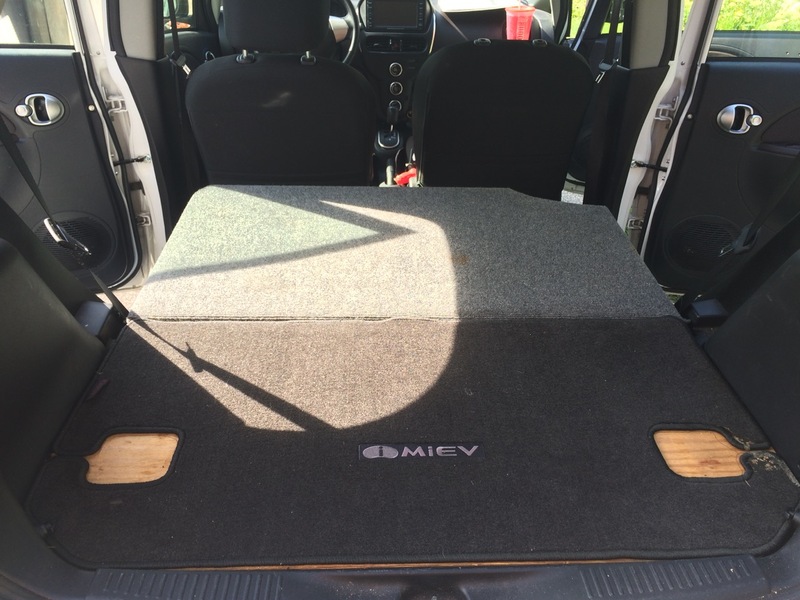 So, the other day, I cut two pieces of scrap plywood to size so that they fit the cargo area and the back of the rear seats when they are folded down. One piece is covered with carpet, and the other with the original rear rug, so they look pretty good too! This lets me carry things like old dead lead-acid batteries without worrying that they will dig right through the back of the seats. The wood is in two pieces so that the one can flip up when I need the back seats, or be completely removed. Yeah, well, I guess I can’t argue with that. The Mitsubishi only is quadruple as efficient as the truck, super-low maintenance as compared to the truck, easier to park than the truck, but still does a SIGNIFICANT amount of the work that I demand of the truck. So, is it a truck? No. However, I’m really having a great time with this car. I LOVE the fact that it JUST PLAIN WORKS. Reliability was getting to be an issue with the truck. I was always a little stressed that something else would go wrong with it right before I had to get to an important job. No concerns at all like that with the EV. I also love the single-speed gear reduction and regenerative brakes for towing! Am I now a truck hater? Nope! We have a long tradition of loving trucks in the U. S. of A., and if you really WORK for a living (building things, laying block, hauling stuff) there’s nothing wrong with having a truck. In fact, I still have delusions of creating a Plug-In Hybrid Pickup. I’m sure that if the car manufacturers got off their butts and built the Ford F-150 Energi or the Chevy Volterado, they would sell them like hot-cakes! How about you? Are you making great use of your electric vehicle in a way that the naysayers won’t believe? Let me know! 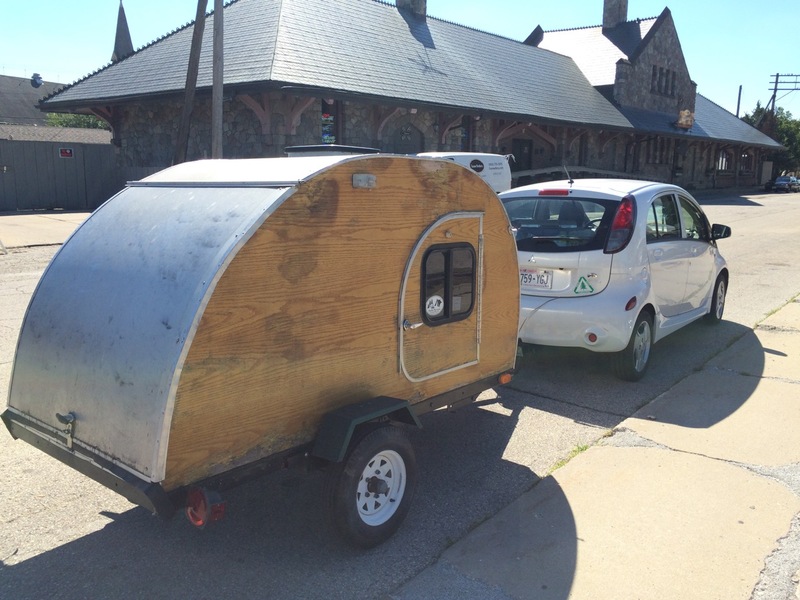 Post a link to your EV towing your trailer,hauling gear, or doing other “Truck Stuff”! PS: A few weeks ago, I took my Little Girl out canoeing with my Dad, in the wooden canoe he built from scratch. Did we take the iMiEV? Nope. We took his truck. If I have to borrow the canoe, I may as well borrow the truck to go with it! A week later, the little girl and I tubed down the same river. We took the iMiEV and used the car’s 12V spare tire air pump to inflate the giant inner tube, then let the air out to pack it back in the car when we were done! 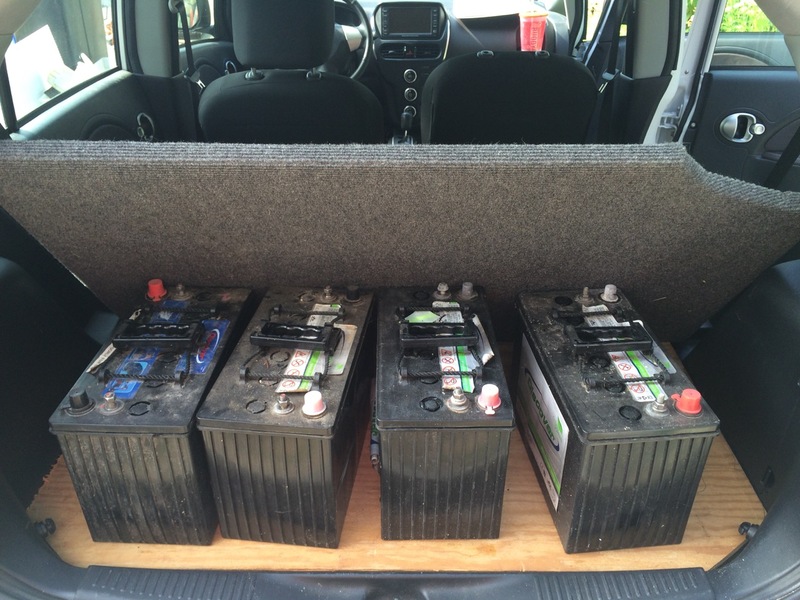 Ben, I always love reading your adventures with your iMiEV. One thing that this little car surprised me was the unusual internal capacity of it when folding the back seats. It’s a combination of vehicle height, slim back rest and vertical shape of the sides from door handles to the roof. Measure roof width and compare to others to get an idea. Yep, I LOVE the capacity in the back! It’s almost a cube shape! The fact that the rear seats fold COMPLETELY flat was a big selling point for me. Like most of us, I’m usually driving by myself, and often with tools and/or cargo. I keep the rear seat flipped down all the time other than when the Little Girl is riding with me. In that case, I just flip up a seat on the one side, and her booster seat even stores nicely in the footwell of rear seat. Great stories, Ben. I loved the camping trip. Now I want to go reinforce the cargo bed with some plywood! I dig this. I wish it wasn’t so but the masculinity factor is a big issue why I shy away from EV. Especially with my field of work. But you’re right- have to look at masculinity from a bigger picture and reducing pollution for future generations is definitely manly.